Room 101… | HAIL DUBYUS! There’s precious little about this in the MSM because it’s something that cannot be gotten by a simple cursory surface reading of the new legislation, which is beyond the capabilities of most of our mainstream journalists, print or electronic, these days. To be fair, I didn’t get it either on my first read-throughs, but fortunately, I don’t just read a few news articles before I form opinions, I read a lot. 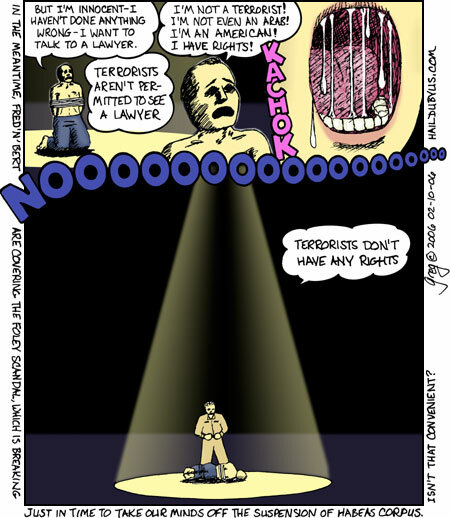 Basically, the new anti-terror legislation which just passed the Senate seriously damages our basic right to habeas corpus. To explain it as simply as possible, habeas corpus is he principle that says that the police can’t lock you up and throw away the key without first bringing charges against you. It is the first line of defense against false imprisonment. Now some may say, well, only criminals need that–us innocent folk have no need of it (heh heh)…well, obviously these people have never had an ex-girlfriend call the police and tell them you were selling drugs to school children (as happened to a friend of mine once LOL). More to the point, suppose protesting the war on terror and writing articles critical of it becomes interpreted as “giving aid and succor to the enemy.” Mark me, there are plenty of nutjobs out there who call anyone critical of OUR LEADER a murderer (even though the real murderers are the people who sent our troops into an unjustified war of choice) because in their minds, anything but blind obedience to His Will encourages the enemy. Imagine one of them as a DA…I’d say that habeas corpus is an extremely important right. BUT, you may object further, the right of habeas corpus is only denied to aliens in the new legislation (as if it were only necessary to treat Americans justly and the rest of the world could go hang). Aye, but here’s the rub. The President can declare ANYONE an enemy combatant. That means citizens as well as aliens. And as we all know, enemy combatants have been detained in Gitmo for the last 5 years without ever having a hearing. If “sedition” becomes a crime, I may have to re-acquaint myself with my relatives in Ontario.